Le’ me ‘splain. No, no, no, there is too much; le’ me sum up. Last weekend I was at San Diego Comic Con as a Special Guest of the convention. I’ve been to New York Comic Con before, but… there’s really no comparison. NYCC has a different character — more corporate, somehow; less eclectic. And it doesn’t take over the whole damn city. SDCC is a city. Guesstimates (this is from one of the con staffers assigned to me as a “handler”) were that 140,000 people were at this one. The convention center’s capacity, note, is 130,000 — but I saw at least one scalper hawking counterfeit badges, so I think the over-max guesstimate is probably correct. And my verdict? SDCC was stunning, overwhelming, awesome, terrifying, and magnificent. The Guest Relations Team took wonderful care of me, and I did my best to take good care of myself — but I’ve still picked up a touch of con crud, which has been threatening all week to become a full-blown cold. And though, sadly, many of my friends were at Readercon (taking place at the same time on the east coast), I got a chance to see some folks I haven’t seen in years, and be on panels with some of ’em — including Marjorie Liu, Brandon Sanderson, John Scalzi, Seanan McGuire, and more. I got to meet some new people, some of whom I utterly and shamelessly fangirled at, including Lynn Flewelling (fantasy writer whose Nightrunner books I’ve loved) and David Gaider (lead writer for Bioware, and my current favorite game Dragon Age) and Stephan Martiniere (the artist who did the painting that became the cover art for the Japanese edition of The Hundred Thousand Kingdoms). Mr. Martiniere gave me a free print of this painting! It’s beautiful and I’m going to be framing it and hanging it in my apartment ASAP. There were not-so-goods. The crowds; holy crap, I’m not generally the type to get uncomfortable in crowds, but I did this time. Fortunately I had a hotel room to retreat to on those occasions when I shunted from “ooh, wow!” into “GRAH, KILL” mode; that helped a lot. I did stand in line for a few events, one of which was the infamous “Black Panel”. I’d heard such good things about that panel from previous years, but this year it was a real disappointment. Shaquille O’Neil was present, hawking a thoroughly unimpressive comic book he’s produced, but that wasn’t really an issue. What annoyed me was that the Black Panel — which had two white members, one of whom was the panel’s only listed woman — had no black women on it. And when questioned about this by an audience member (and me, via Twitter), the moderator blew it off with something completely bizarre: (paraphrase) “We get this question every year. We’ve made a real effort to include women in previous years, so I don’t know why they keep asking it.” Maybe because you gave up the effort, dammit. 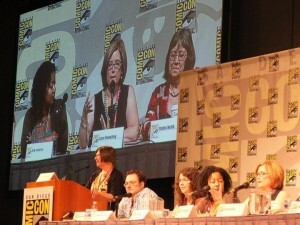 Worse, the panel was nothing but a banter-and-love-fest between the panelists; there was nothing informative about it. I’d come hoping to get some exposure to new artists, new books, news about cool stuff forthcoming. Other than Shaq’s (repeat: unimpressive) comic book, there was none of that. I left before the panel ended, honestly; I got bored. And the Firefly Reunion, for all my excitement, was a disappointment too. Half the cast wasn’t there, including the actors who played my favorite characters (Zoe, Kaylee, Inara, and Book). And there was a seriously oogy moment when an Asian fan stood up to ask about Firefly’s infamous exclusion of Asian characters/actors from a supposedly Asian-dominated universe. Whedon’s answer was… less than satisfying. Also, I almost got a photo with Anthony Bourdain, but the fanboy I gave my camera to took a lovely photo of his thumb. HULK SMASH. I confess I’m a bit terrified of SDCC. Crowds bother me, a little, and I think crowds of that size would freak me out. But I do love reading the reports. I do know how you feel. I too am not a crowd person. The 3000 fans at Finncon was just about the right number. And while I don’t think I have concrud – yet, I am definitely in recovery mode: brain dead and functionally useless. I got to meet Tom Crosshill, who supported me brilliantly during my presentation of Diversity in the Work of N.K.Jemisin. Isn’t he a cupcake! I have to confess, writing something that would take me to SDCC is one of my life’s dreams…so I am so excited for you! Sounds like an overwhelming experience, but still one that is truly awesome. Hope you kick the concrud! Seeing your panel at SDCC was my highlight of the weekend. Kudos to you for taking control of the panel and conducting it in a fun and organized manner even flying completely solo! One would never have guessed you were a SDCC newbie. I really enjoyed hearing the excerpt reading, thank you for bringing that with you — it made the experience that much more special to get that bonus. I dragged in an unconvinced friend with me who had never read any of your works, and she was so impressed at the panel that she’s now starting on the 100k trilogy. Also – I echo your frustrations about the Black Panel – I had the same kind of experience at one of the other progressive themed panels at SDCC. I hope that you can make it back to SDCC again sometime soon, even as exhausting as it is… If anything, at least you’ll know something of what you’re in for, the second time around. Hi. I attended the Racebending panel not having heard of your books before, and you were so fabulous and intelligent and funny that I am now reading The Hundred Thousand Kingdoms and loving it. Please do come back to SDCC sometime! Until then I will just have to closely follow your blog.